It's been about a year since LCG first premiered. I had no idea when I started this little experiment whether it would take, but over the year I became pleasantly surprised at the interest it generated as well as my enjoyment of blogging. Unfortunately, it became clear to me that this particular blog has run it's course. So I'm closing the doors on LawyerChefGirl and opening a window to the more ambitious, and hopefully more exciting blogging adventure that I've dubbed DomesticEsq. Please check out and subscribe to my new blog, www.DomesticEsq.me. 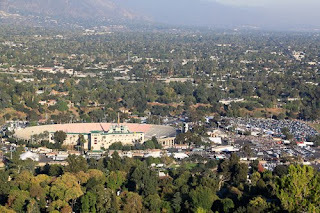 Living above the Rose Bowl definitely has its perks. 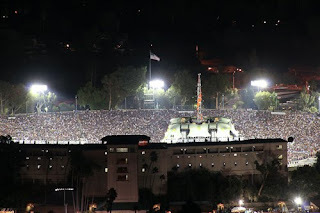 Not only do we receive a heads up once UCLA scores a touchdown when we hear the crowds roar 10 seconds before the tape delay airs the play on TV, but on occasion we're treated to the musical genius of large bands whose fan base can fill the near 100,000 seats. Last weekend U2 picked Pasadena to host the stop on its 360 Degrees Tour that it chose to broadcast to fans around the world. U2 streamed the show live on YouTube, making it the first band to do so in real time on the site. The concert also broke the record, which was previusly set by U2 in 1987 on its Joshua Tree Tour, to headline a concert with the highest attendance record in US history. And this was the concert the band chose to film its tour DVD. Needless to say the stage was set (literally) for a fantastic event. For a full week before the concert we heard workers building the stage and checking the lights and sound system at all hours of the night. About two hours before the show fans started to arrive and U2 performed its final sound check. By 7:15, opener Black Eyed Peas took the stage, and rocked it, at one point calling on Slash to join them for a rendition of Sweet Child of Mine. 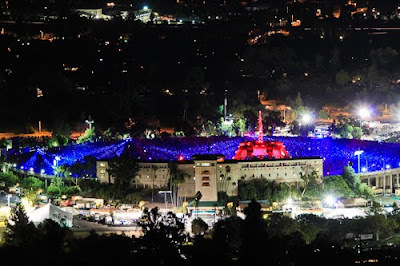 By the time U2 took the stage, shortly after 9 pm, the Rose Bowl was so packed they had park the cars on the fairways of nearby Brookside Golf Course. U2's massive stage towered above the stadium, and though we couldn't see directly inside, we had front row seats for the amazing light show, heard the songs perfectly, and ran into the house to catch the best moments on YouTube. U2 played old favorites, such as "Where The Streets Have No Name" and "Sunday Bloody Sunday," and recent hits including "No Line On The Horizon" and "Beautiful Day." My favorite song of the night was the touching performance of "Walk On," written by Bono for Myanmar's benevolent imprisoned human rights activist Daw Aung San Suu Kyi. To commemorate our first free Rose Bowl concert in the new house, we invited family and friends to join in the fun and listen to the show on our outdoor patio, complete with grilled burgers, beer, and wine. 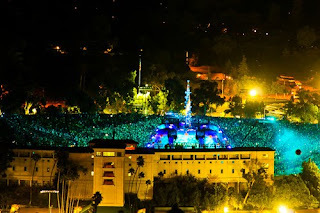 By the time the show ended at 11:30 after the 4th encore, our guests left satisfied, and we chuckled, grateful as we stumbled off to bed enjoying a healthy buzz while 100,000 concertgoers had to sit for an hour trying to exit the parking lot. Yom Kippur, the holiest day of the Jewish year, is a bittersweet one for me as it marks the day of my mother's death. Rather than wash myself once more in grief, this year I decided to atone for my sins in Wyoming. 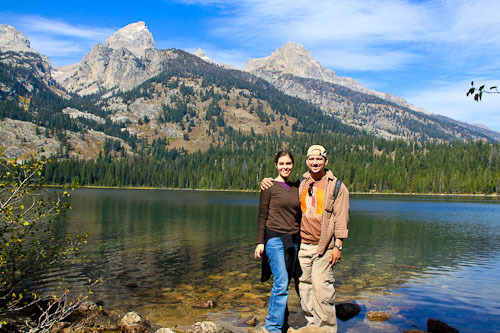 Autumn is the perfect time to visit the national parks of Grand Teton and Yellowstone, if you can make it before the weather turns icy. 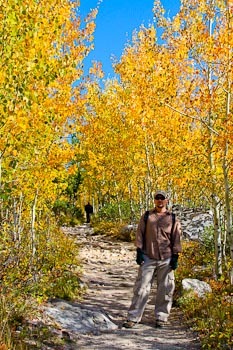 In autumn the leaves of the aspen trees turn yellow and red, the animals are all out in force trying to fatten up before the winter, and the air bathes your skin in electricty as you hike through the bush. Having never visited a national park outside of California, I was surprised to learn that here, the animals are hunted with camera, not rifle. Amateur photographers and tourists scout for wildlife, then pull off to the side of the road, furiously set up their tripods and cameras with the mamajama lenses weighing at least 1/2 a ton, and snap away at the elk or moose or antelope far off in the distance with an intensity to rival any National Geographic pro. Even Big N and I got into the spirit, pulling over whenever we saw a stalled car and asking "whattya got" to tourists already in prime position. Grand Teton did not disappoint. In a span of less than two hours we feasted our eyes on moose, elk, antelope, and bear. Unfortunately, fires closed most of Yellowstone so we'll have to return there on another visit, after I upgrade my photographic equipment and actually learn how to take a decent wild beast shot. Consider it training for the african safari. Here are just a few shots that I hope capture even a glimmer of the majestic beauty of Wyoming. 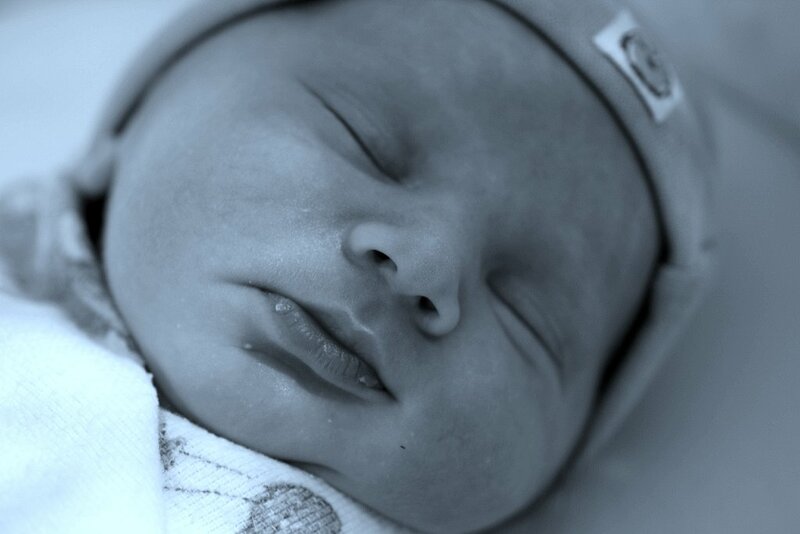 On Monday my adorable sister-in-law gave birth to Daniel Paul. Already a big boy at 8 lbs. 7 oz, Daniel arrived in style, behaving like an angel and making soft cooing noises when Auntie LCG held him for the first time, and showing off his perfectly developed lungs to the nurses when they poked and prodded him, counting up fingers and toes. Little Danny, clearly advanced for his tender age, seems to have no problem expressing his emotions. My older brother is already smitten with his first born, who in my humble opinion has his lips and eyes and his mother's nose and cheeks (at least for the time being). Watching my brother melt as he gazed into Danny's baby blue eyes brought tears to mine. As soon as I held him and caught the first trace of his baby smell, I felt an instant connection, and knew with certainty that I will love this child and protect him just as surely as if he were my own. The miracle of Daniel's birth reminded me, for the first time in a while, how powerful and unshakable is the bond of family. On my last trip to Paris, I tasted a little piece of heaven in a bite sized cookie: the delectable French Macaron, not to be confused with the coconut macaroon. I love macarons so much I served them at my wedding (along with creme brulee) in lieu of traditional cake. The macarons for my wedding were created by local macaron artist, the very sweet (and very French), Paulette, who custom made them in the colors of my wedding. 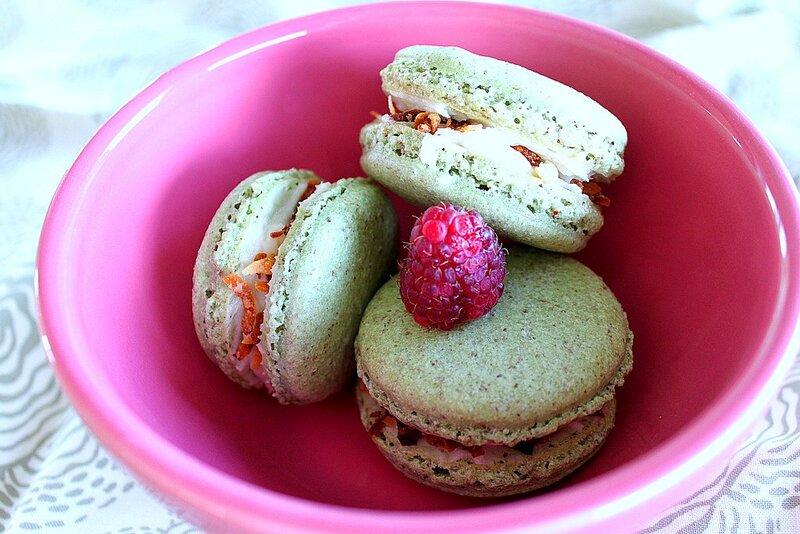 I've also tried to master baking macarons so I can enjoy them regularly. But not being a pastry chef has left me somewhat disadvantaged. You see macarons are temperamental. Over mix your batter and they collapse. Fail to use the correct almond flour or proportions of egg whites, and the cookies come out dry and boring. 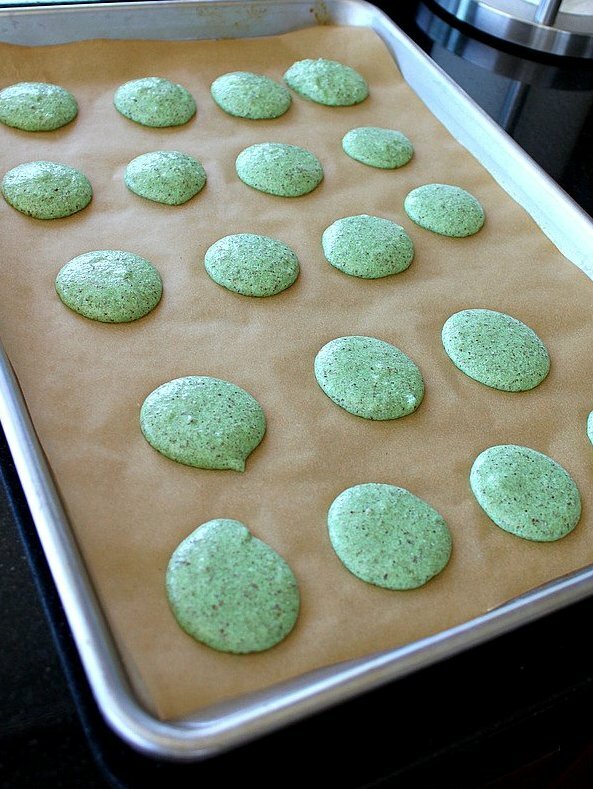 Use the wrong baking sheet, or try silpat instead of parchment paper liners, and the cookies fail to crisp on the edges. In my quest to master macarons, there have been several failed attempts, and I was so disheartened that I stopped trying. This weekend however, I was inspired to try again. My dear friend "Dolce" is getting married today. She was the one who picked up the macarons for my wedding from Paulette and hauled the delicate cookies all the way to Ojai; no easy feat. Last night I decided to repay the favor by baking macarons as a special treat for her before her wedding. 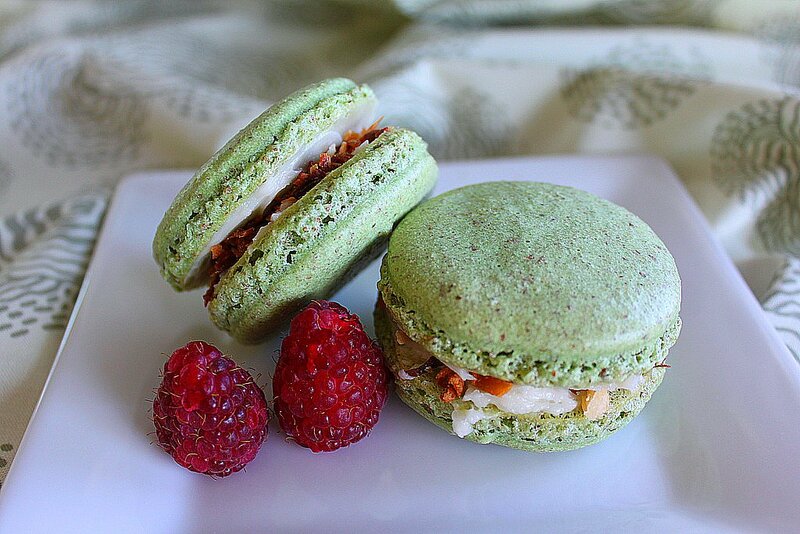 Luck was on my side-- the macarons I created for Dolce, Green Tea with Coconut Cream and Toasted Coconut, were nearly perfect! The cookies came out crunchy on the outside and chewy on the inside, and the coconut butter cream frosting was sweet, but tempered by the toasted coconut. I was so pleased not to have messed them up, that I baked another flavor this afternoon to bring to my friends Sage and Turquoise's house for Turquoise's birthday tomorrow: Chocolate with Tahitian Vanilla Bean Frosting and Fresh Raspberries. (I brought the Tahitian vanilla beans back from Tahiti on my honeymoon). 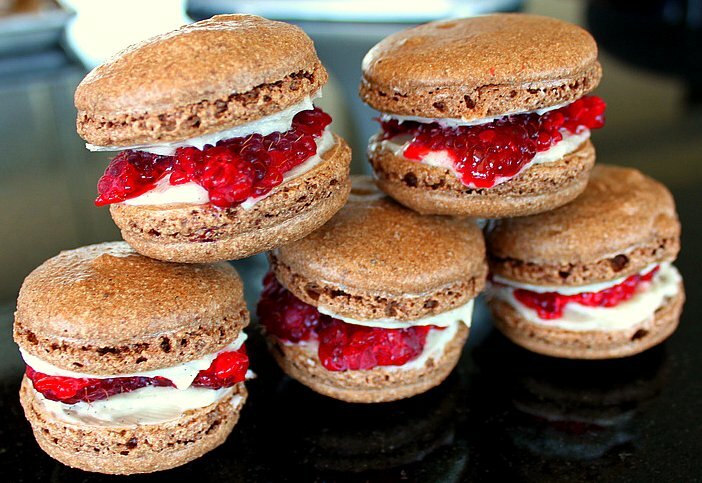 Recipes for both macarons follow, but make sure you put on your "patience" cap because speaking from experience, it may take you a few attempts to get these right. Trust me when I tell you however, they're worth the effort. Sift confectioners' sugar, almond flour, and green tea or cocoa powder, set aside. Whip egg whites until frothy, and add sugar and food coloring if using; whip until stiff. Gently fold in the almond flour mixture, 1/3 at a time, until the batter looks like deflated marshmallows; be careful not to over mix. Place batter in pastry bag with large tip and pipe onto cookie sheet lined with parchment paper. Let sit for 20 minutes (to let the batter dry a bit so it develops a harder shell). Bake at 300 degrees for about 17 minutes. Using whip attachment, cream softened butter. Add confectioners' sugar and mix. Drizzle in flavorings and mix again until incorporated. 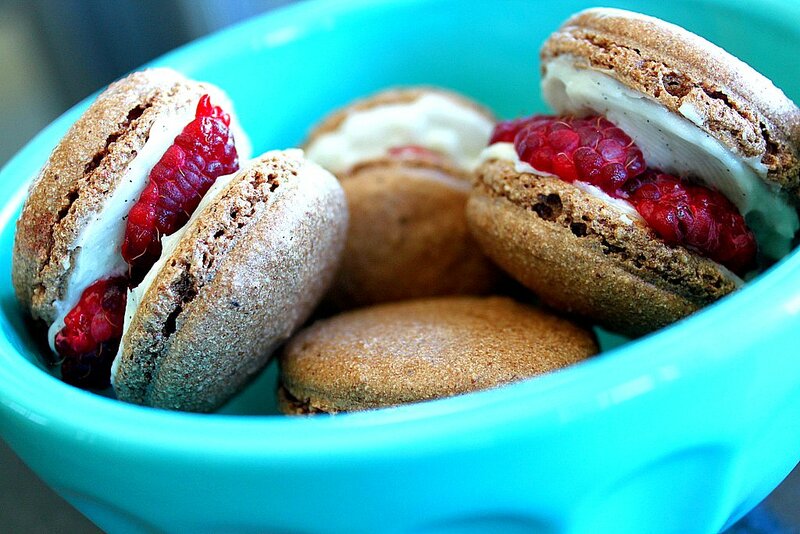 Assemble macarons by spreading frosting and "extras" between two cookies. Enjoy! This weekend I threw a baby shower for my sister-in-law, who is due to give birth to my soon to be nephew in September. Though I would have loved to cater the entire shower, I quickly wised up and realized 30 people requires an entire week of serious preparation so I ordered deli meats for lunch and resigned myself to making just cupcakes for dessert. Making 3 dozen cupcakes only requires one long Friday night of work, totally doable. I decided to make vanilla (recipe courtesy of Amy Sedaris, she's a hoot) and red velvet with cream cheese frosting. I also cheated a little and ordered baby themed sugar toppers on line. The cupcakes were darling, and I displayed them on my cupcake tree at the shower (yes, a cupcake tree is a complete necessity in my book). I was convinced before the shower my perfectly decorated cupcakes would be the hit of the party. Unfortunately the attendees weren't quite as excited to eat cupcakes as I'd hoped and they didn't exactly fly off the tree. Perhaps I should have considered that my sister-in-law is a nurse and naturally all of her nursing buddies would ponder their health and their thighs before stuffing their faces with sugar and butter filled treats. My first hint was that most of them passed on the rye bread and pasta salad at the lunch buffet. Only 12 of the 36 were savored, leaving me to fill the to-go boxes I bought for just this contingency and force them on my family members. Next time I'll stick with something healthier, sugar free jello anyone? Always in search of a great new restaurant, on Friday I consulted my handy KCRW "Fringe Benefits" guide and found reference to Bashan Restaurant, located near the heart of hip Montrose area (but with an unfortunate Glendale zip). 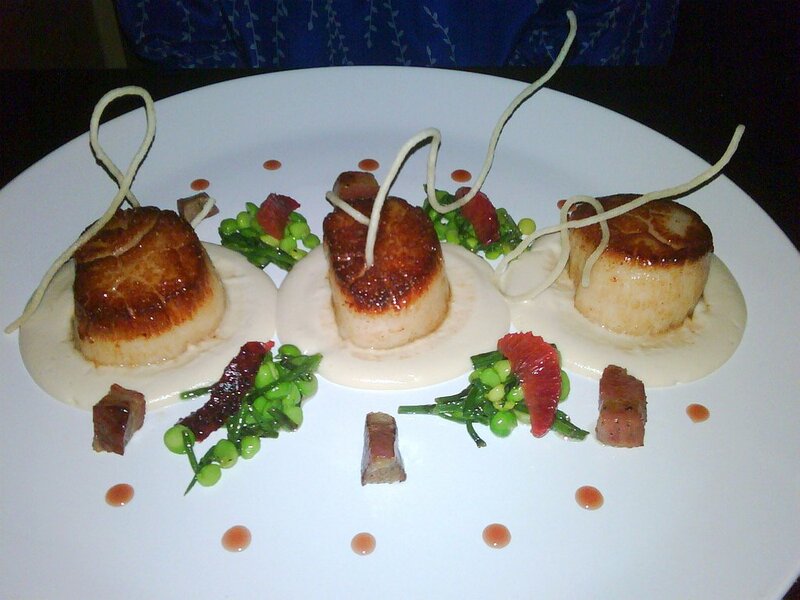 The ambiance at this 16-table bistro style restaurant was warm and casual, and staff were friendly and upbeat. Little did I expect that the executive chef, Nadav Bashan, would delight and amaze us with his impressive skills. Bashan got his start working for some of the greats before going out on his own two years ago, after impressive stints as sous chef at Michael's and Providence (see my other posts here and here re the delights of Providence). 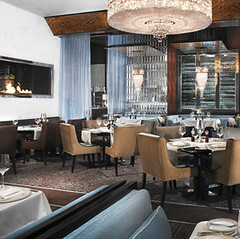 In his own restaurant he blends french techniques with asian and mediterranean influences. 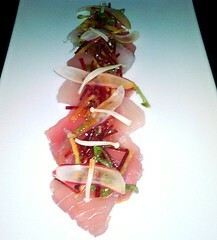 before proceeding to our starter of thinly sliced albacore with red and yellow beets and pickled enoki mushrooms. 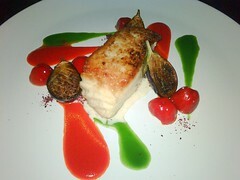 Impressive knife work on this dish, with light and tangy marriage of flavors between the beets and fish. For the main course I ordered New Bedrord Scallops with cauliflower puree, sea beans, soba noodles, crispy pancetta, peas and blood oranges. Big N ordered Alaskan Halibut with pappadew peppers stuffed with eggplant, tahini, sumac, and grilled mini eggplants. Our plates were beautiful works of art with color and flair, while the fish was seasoned simply so it could shine all on its own. The sides were gracefully paired to personify the cleanness of the fish. We paired our meal with a non-vintage Conde de Subirats Cava from Spain. Cava is a light sparkling wine without the pukey after taste of some Champagnes. It's fairly dry but crisp and slightly sweet, and paired extremely well with our albacore and fish dishes. If you're not too aghast to leave behind the overinflated egos and overinjected faces of the Westside scene for a night, then head over to the Eastside for a relaxing walking tour of quaint downtown Montrose and a delightful dinner at Bashan. You'll be rewarded for near-Providence quality food without the annoying Westside crowds. I LOVE Vegas. The lights, the glamour, the energy, the over-the-top tackiness, the gambling, the shopping, and the food, and the food, and the FOOD. The Vegas of old with its $1.99 prime rib served lukewarm in a dreary downtown bingo room is no more. In the span of a mile you can now find 16 world class Michelin starred restaurants. Vegas has enticed nearly every well-known chef to open a restaurant. Recently Big N and I decided last minute that we'd crash our friends' H+M's trip to Vegas to visit friends who live there. We booked a room at our new favorite hotel, the Palazzo. 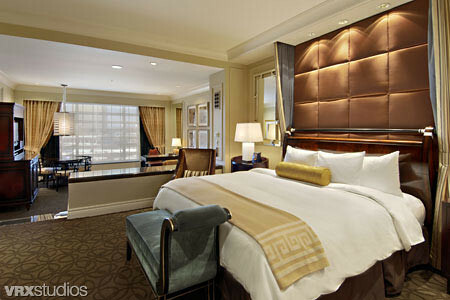 The Palazzo, an all-suite hotel, is on a great spot on the strip, sandwiched between the Wynn and the Venetian. It boasts modern (read: not too tacky) design, and a decent offering of restaurants and shops. On our last trip to Vegas, the Palazzo upgraded us to a 1500 sq. foot suite just for frequenting their hotel on a dead weekend; no such luck on an upgrade this time but even the suite for the masses is spacious and decked out in brown marbles and red velvet furniture, with soft linens and 3 flat screens, plus samples of expensive face creams from the Canyon Ranch Spa (for my ladies out there). For dinner on Friday I attempted to reserve a table at Vegas's only three Michelin starred restaurant, Joel Robuchon in the MGM Grand, but not surprisingly, we couldn't impress the hostess at the best restaurant in town by regaling her with tales of our last minute weekend jetsetting. So we "settled" for one starred Daniel Boulud Brasserie in the Wynn, where I dined on a lovely duo of beef, filet and short ribs, and a crab salad starter. Unfortunately, I got a little happy on wine and neglected to take a single photo, but I do recommend the restaurant. It's upscale but not snobby. They also make a fabulous fig bread (most of mine however ended up on the floor in an unfortunate mishap with the butter). On Saturday we joined our friends at Hank's, a steakhouse located about 20 minutes off the strip at the Green Valley Ranch Resort. If you dare to drive to Vegas and have a car with you, Hank's is a must-dine. The restaurant is a classy joint with crystal chandeliers and velvet booths, but jazzes it up by pumping live rock music into the dining room. Steaks are cooked to perfection, and the side dishes are phenomenal. My favorite accompaniments to the petit filet were the mac & cheese and creamed corn. 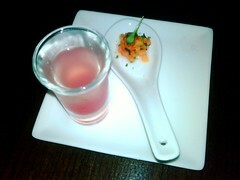 Plus the cocktails are pretty fabulous as well. The wine list isn't the greatest but you won't have trouble finding a good cab to go with that steak. We settled on a cabernet sauvignon from the Howell Mountain area of Napa, though the name of the producer is escaping me. Though I restrained myself on the shopping (even resisting picking up something at the fab Catherine Malandrino store in the Palazzo shoppes), I did manage to leave a winner thanks to my new favorite game: Three Card Poker. Taking advantage of my beginner's luck, I scored a three-card straight flush, which paid me 40 to 1 odds on the bonus. I love that town! My neighborhood Bristol Farms sells Australian Wagyu beef. Now I know that beef connoisseurs out there love to whine about the kobe/wagyu debate, (what is the real Kobe? didn't the Americans steal bovine sperm from the Japanese? etc. etc.). As for me, I just like good meat, and I'm not particular about where it comes from, as long as it's not riddled with hormones and antibiotics, the cow had a relatively good short life, and grass actually passed through his stomachs at some point. I don't get too caught up in organic snobbiness, because anybody who's read The Omnivore's Dilemma knows that a lot of the "organic" industry is a crock. Anyway, last night we tried the Wagyu Tri-Tip and as skeptical as I was about cooking successful Wagyu at home, I have to admit the difference was huge. Big N handled the tri-tip, and I provided the assist with sides. He seasoned it simply with my homemade dry rub (created with brown sugar, kosher salt, and a plethora of seasonings in my pantry) and a little olive oil, let it sit for 30 minutes (no overnight marinating required for this beauty) and cooked it to perfection on the grill. For sides, my mother-in-law blessed us again with home grown carrots from her garden, which I boiled until soft and added a little butter, apricot preserves, fresh nutmeg, lemon zest, a little lemon juice, and parsley. I also sauteed fresh shiitake and oyster mushrooms in olive oil, butter, and garlic, and added white wine and some finely diced greens from the tops of the carrots. The meat was delicious, perfectly marbled and fatty, and soft and juicy. The carrots tasted fresh as only home grown produce can taste, and the mushrooms were tasty (but I admit I got a little happy with my celtic sea salt). Big N paired our meal with a Pertimali Sassetti Livio 2003 Brunello di Montalcino, made from sangiovese. The wine smelled of stewed cherries, cedar, and eucalyptus, with a full but approachable palette of licorice, leather, dark fruits, and a little smoke. Very satisfying for a Wednesday night. Thanks to the fatty Wagyu, this meal was restaurant quality. Since LCG is getting serious about her blogging, my little point and click camera simply wasn't cutting it anymore, so I upgraded to a beginner DSLR. These days, you can get a pretty great camera for less than $1,000. After consulting with my fellow bloggers and photographers, I decided to stick with Canon and bought the EOS Digital Rebel T1i. If you're not into gadgets, then this post really isn't for you, but I have to gush about how sweet this camera is: 15.1 Megapixel Canon CMOS sensor, DIGIC 4 Image Processor, a 3.0-inch Clear View LCD with anti-reflective and scratch-resistant coating, and compatibility with the EOS System of lenses and Speedlites, the EOS Rebel T1i adds remarkable Full HD video capture at resolutions up to 1920 x 1080. After a bit of overindulging in the food department in Vegas this past weekend, I knew my body needed to return to eating light. Last night's Monday Night Fish was inspired by the beautiful heirloom tomatoes that my mother-in-law gave Big N and I from her garden. I sliced the yellow heirlooms and stacked the slices vertically with sliced watermelon, held together by a dollop of fresh ricotta cheese in between each layer. I drizzled a little balsalmic vinegar and olive oil, sprinkled celtic sea salt for flavor, and garnished with fresh basil for fragrance. The mild ricotta went well with the sweetness of the heirlooms and watermelon, and the salt provided flavor and texture to this colorful summer salad. For the salmon I kept it light and simple, seasoning it with salt, pepper, a bit of olive oil, searing on both sides, and finishing it up in a 400 degree oven. I placed the salmon on a bed of sauteed sugar peas, seasoned with salt, pepper, and a little sugar to carmelize. In under 20 minutes we had dinner on the table, complete with a crisp Cottonwood Canyon Chardonnay. A perfect summer meal. For our first anniversary Big N and I celebrated with a mini-break to Santa Fe. Santa Fe, if you've never been there, is a completely unique experience. Nestled in the high desert of Northern New Mexico, the town stays true to its rancho roots, with old adobe buildings at every turn, and rich painted landscapes that cross the rolling desert sky. We stayed at the Encantado Resort, a brand new Auberge property just outside Santa Fe in Tesuque. Upon checking into our "casita", a private bungalow with desert sunset views, I was greeted with a fragrant bouquet of roses and fire lilies sneakily arranged by my husband. (He's good). Our first full day we spent in the old town of Santa Fe, visiting the art galleries. Santa Fe boasts the second largest art market in the US, behind NYC. There are hundreds of galleries around the city featuring local and international artists of paintings, sculpture, and mixed media. 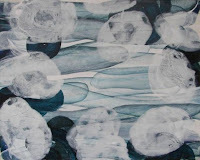 I purchased a small modern painting by Katrin Moller, entitled Gemaltes 48, from the Gebert Contemporary gallery. Big N found a few sculptures he's considering, more on that to come. On a friend's recommendation, we ate at The Shed, which features excellent New Mexican cooking and delicious red and green chili sauce. The next day, after huevos rancheros on the veranda, we drove up to Taos, about 2 hours from Santa Fe. The drive takes you farther north through old rancho villages along the way. We spent some time admiring amazing hand-woven blankets from artisans in the Chimayo Village. For 8 generations these weavers have mastered their craft. We couldn't resist ordering a custom multi-colored blanket for our bedroom. In Taos we visited Native American pueblos, churches, and a couple of fly fishing shops. On the way back from Taos we took the low road along the Rio Grande, ending up back at our hotel to dine at the amazing restaurant, which mixes New Mexican cuisine with seasonal faire. On our last day, we decided to check out a ranch for sale between Santa Fe and Albuquerque before heading back to the airport. The owner, Dean (a sharp witted Texan whose office is next to Val Kilmer's, the next gubernatorial candidate of New Mexico), drove us by jeep through the backwoods alongside sleepy villages to a 100 acre ranch. Half a mile of the Pecos River runs through the canyon at the bottom of the ranch, 400 feet below a cliff that overlooks the river and thousands of acres of Spanish land grant property. The ranch, while beautiful, is obviously meant for hearding livestock by rough and tumble cowboys, and isn't quite as suited to a couple of city slickers. Though I wish we had another day or two to spend getting to know Santa Fe and its culture, we enjoyed our mini-break and intend to return in the future. Santa Fe offers a unique opportunity to explore the history of the old and mostly untouched Southwest, but in a luxurious style to which I've become accustomed (thanks to my husband, who knows how to spoil me).